This painting depicts the Old Testament story of the shepherd boy David, who triumphed over the giant Goliath (1 Samuel 17: 41-51). Using a single stone from his sling, David killed Goliath and then decapitated him. 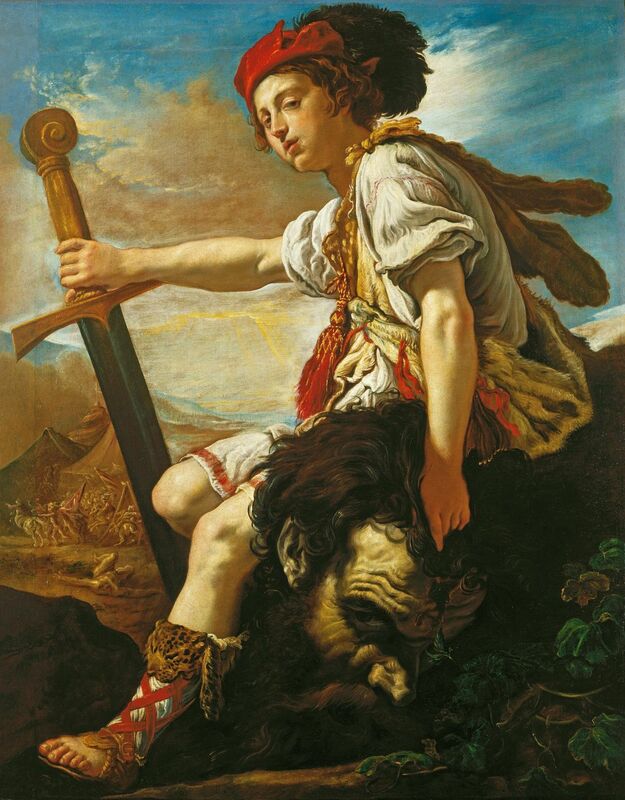 Here, at the conclusion of the drama, David leans against the head of the giant, grasping his hair in his left hand while in his right he holds Goliath's huge sword. In the background the headless corpse of the giant lies upon the battlefield as the Philistines are overcome by the Israelites. Fetti painted a number of different versions of this subject, which were widely copied by his workshop and later followers. Versions by Fetti are found in the Akademie der Bildenden, Nuremberg, the Pushkin National Museum, Moscow and the Gallerie dell'Accademia in Venice. However, the composition of each of these paintings varies considerably and the most notable work with particular similarities to the Royal Collection version is his David and Goliath in the Gemäldegalerie, Dresden. Fetti painted this work at the height of his career while employed at the Gonzaga court in Mantua. It is typical of the artist's mature style, using dramatic compositions executed in a painterly manner. Fetti employed canvases primed in dark tones and he typically applied paint quickly using short, rapid brushstrokes to build up a vivid contrast between light and shadow. While Eduard A. Safarik has proposed the possibility that this painting may have been a workshop copy, it seems highly unlikely. The handling of the paint is spontaneous and applied in a self-assured manner. The existence of numerous pentiments also suggests that the artist was still working out aspects of the composition while painting. Unlike the Dresden version and a preparatory drawing for the subject (J. Paul Getty Musum), Fetti changes the position of David's right hand to grasp the sword of Goliath in a more active manner. In the 1627 inventory of the Gonzaga collection in Mantua there are two descriptions of paintings of 'David with the Head of Goliath', which may be identifiable with the Royal Collection painting by Fetti, although neither is attributed to a particular artist. One, valued at 24 lire, was in the long corridor between Santa Barbara and the Castello; the other, valued at 90 lire, was in the Galleria Piccola. It is likely that both were acquired by Charles I. In 1649 the records of the Commonwealth sale mention a 'David w.th goliagh. Head by ffette', valued at £20. This painting was later sold on 16 January 1652 to Robert Houghton. In 1650 the inventory of the collection of Charles I at Somerset House mentions a 'David with the Head of Goliath', which is probably the other Fetti painting of the subject recorded at Mantua and now lost. Following the Restoration, a version of the subject attributed to Fetti again entered the Royal Collection and it was hung in Whitehall. It is likely that the canvas was enlarged during the time of William III when the frame was built and the additions, which can be noted on all the edges of the canvas, were probably added at this point. Subsequently, during the reign of Queen Anne, the painting hung over a door in the Drawing Room at Hampton Court.